Jon Bowermaster first went to the Maldives to report on a tsunami that swept through the Indian Ocean. Now, rising sea levels present a bigger threat to the Maldives than the tsunami did. The average height of the chain's islands is only four feet above sea level and several islands have already been evacuated to escape the rising seas. 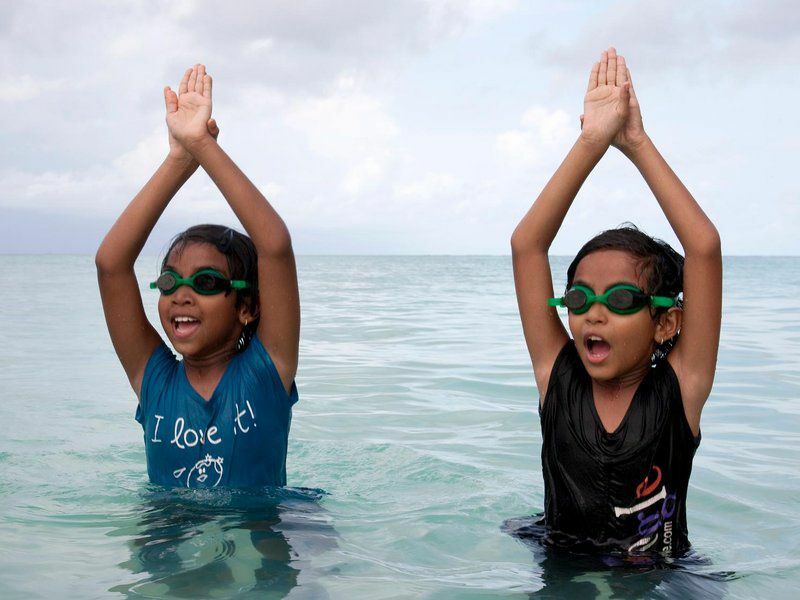 Bowermaster returned to the Maldives to film "Sink or Swim: Learning the Crawl in the Maldives," which documents a swim class for third-graders and their mothers on the island of Eydhafushi and the effects of climate change already felt by the Maldivian people. Smithsonian.com spoke to Bowermaster to learn more about sea level rise in the Maldives. Why did you create and film a swim class in the Maldives? Having spent a decade and longer traveling around the world's coastlines, it was amazing to me how many people we met who had never been properly taught to swim. I realized this was true in the Maldives as well. I did a presentation in a school and I asked the kids if they could swim; most of them said no. And I asked them if they had ever seen what was underneath the ocean's surface. A lot of the kids are told by their parents that the ocean is like fire, something to be scared of, because parents don't want to have to worry about their kids. We really wanted to introduce swimming to these young kids. They're in third grade, we wanted to get them in the water and we wanted them to understand the marine ecology that surrounds them. We wanted them to become better caretakers of the ocean. Why do you think it's important for them to see beneath the water? It's pretty simple: If you don't know something, you certainly won't protect it and as a result, along the crowded islands where most of the population of the Maldives lives, there are horrific pollution problems. They throw their trash straight into the ocean. I don't think they understood the connection between marine ecology and its health and the fact that they were throwing garbage into the ocean. How bad is the ocean trash problem on Eydhafushi? Three thousand people live on one island and I didn't see a public trash bin on the streets. Every island has a big trash dump where they burn stuff, but most of the people take their garbage bins straight from their apartments or their homes and just throw it right on the beach or into the ocean. Because tourism is the top industry in the Maldives, preserving their beaches seems pretty important. Absolutely, at the center of their economy is diving (and) tourists come there to swim and to dive and to luxuriate in what are, if taken care of, really beautiful waters. I can't tell you how many high-end resorts there are in the Maldives. Most of them occupy an entire island, a small island, and they're very well maintained, but on the nearby community islands where the Maldivian people live, they are often crowded and unswimmable because there's so much stuff in the ocean. They also face rising sea level and warming waters, so is climate change a major issue there? I've asked if they make the connection between warming climate and rising seas, and to be honest, they don't make that link. That's really difficult for them to see or understand, and if you try to explain carbon emissions in a place where they barely create carbon emissions and suggest that that's why the seas are rising higher on their little islands - it's just a total disconnect. You call the Maldivian people some of the first climate change refugees, so how have they already started to adapt to sea level rise? There are 15 islands where the populations have already had to move because sea-level rise was impacting their ability to live in the homes that they had built, in part due to erosion. The water is climbing higher and higher and washing away what would have been their beachfront. They've moved to bigger islands, in part because of climate change and in part because they want access to schools and nurses and doctors and things like that. How did students in the swim class react when they saw beneath the surface? 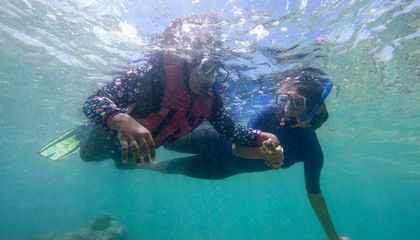 They had never seen fish before, other than what their parents would bring out of the fishing boats (and) on the final day of the two-week class, we gave them snorkels and masks and fins and life jackets. They went out over their heads. And they were thrilled! They saw turtles and big fish and coral. Did they seem more interested in ocean conservation afterwards? We did a slideshow for the kids at their schools (and) talked about my experiences and my interest in ocean conservation, and how they needed to be conscious of overfishing and pollution. I tried to explain acidification and sea level rise. Maybe a few of them got it, but it wasn't an overwhelming rush where they felt like, "Oh, now I get it." But the teachers did. And the teachers can incorporate it into the curriculum. What would signal to you that the project was a success? We had 48 kids come and show up every day (and) to be honest, I anticipated dropouts (because) I just thought they'd be bored, but they were so happy. We did this for just one school on one little island, in the spring of 2014, so this year, they did it again, adding another class for a couple different islands throughout this one atoll. The first time, we brought three swim instructors who were experienced from the states, and they taught a dozen Maldivians how to teach swimming. The idea is to spread this notion throughout the Maldives. And, you know, I think it is going to work. What does “crawling” have do to with sinking or swimming? I would love to be able to have a class outside in the water. It would be so much more fun and enjoyable. I would actually be able to learn in an environment like that. Crawling is related to sinking or swimming, the way it is used in this article, because it refers to children learning a new skill, swimming. Just as they first learn to walk, crawling until they find their footing, they will also crawl their way into learning to swim. The word is used more as a sense of expression, not to be taken literally, because people can't actually crawl in the ocean.